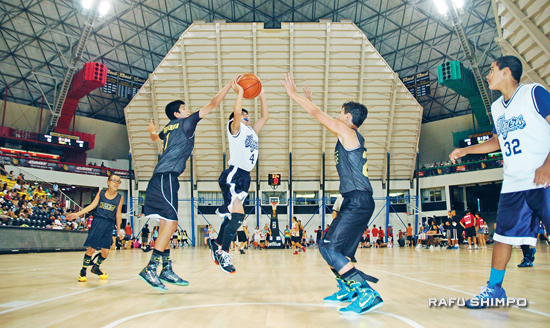 The 2014 Nikkei Games Basketball Tournament was held Aug. 16-17 at the Pyramid at Cal State Long Beach, with new highs in participation. Now in its 11th year, the event featured over 1,900 players on 476 teams, playing 952 games. Add the staffs and supporters, and there were an estimated 6,000 people in the Pyramid over the two days. Results of the tournament are below, with more to come in Saturday’s Rafu Sports. 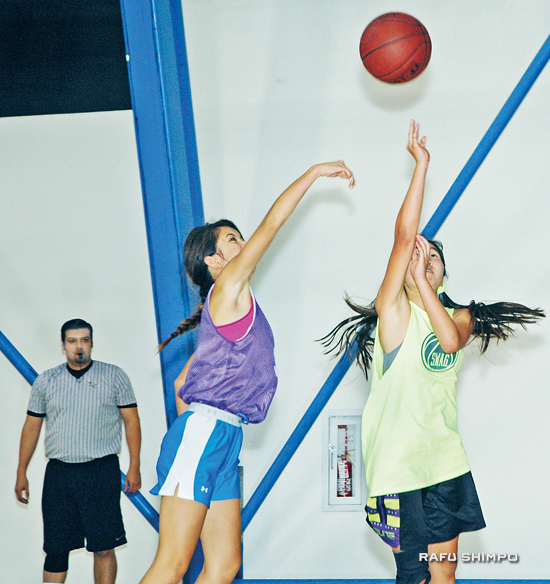 gold: OCO Super Smash Bros.
SWAG’s Emily Ozima launches a three-point attempt out of the reach of Paige Tokuhara of the Saikos. Nikkei Games official Judy James takes on the task of awarding medals.